Severe rigours mark the onset of this disease in humans. Fever, headache and malaise are other non-specific symptoms of this disease which may last for a period between 1 to 6 days. Signs which develop during the acute encephalitic stage include neck rigidity, cachexia, hemiparesis, convulsions and a raised body temperature between 38 and 41 degrees Celsius. Mental retardation developed from this disease usually leads to coma. Mortality of this disease varies but is generally much higher in children. Life-long neurological defects such as deafness, emotional lability and hemiparesis may occur in those who have had Central Nervous System involvement. The diagnosis of this disease is made by detecting antibodies in serum and CSF (cerebrospinal fluid) by IgM capture ELISA. A vaccine is available but anti-virals are usually ineffective unless administed within hours of being infected, hence treatment is mainly supportive. Japanese Encephalitis is not transmitted between humans. Infection with JEV confers life-long immunity. 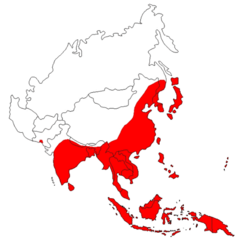 Japanese encephalitis is the leading cause of viral encephalitis in Asia with 30,000â€“50,000 cases reported annually, case-fatality rates range from 0.3% to 60%. Rare outbreaks in U.S. territories in Western Pacific have occurred. Residents of rural areas in endemic locations are at highest risk, Japanese encephalitis does not usually occur in urban areas. Countries which have had major epidemics in the past, but which have controlled the disease primarily by vaccination, include China, Korea, Japan, Taiwan and Thailand. Other countries that still have periodic epidemics include Vietnam, Cambodia, Myanmar, India, Nepal, and Malaysia. Japanese encephalitis has been reported on the Torres Strait Islands and two fatal cases were reported in mainland northern Australia in 1998, the maintanance of spread of the virus in Australia is of particular concern to Australian health officials due to the unplanned introduction of Culex gelidus, a potential vector of the virus, from Asia. As of September, 2005, a Japanese Encephalitis outbreak is ongoing in India. Japanese encephalitis is an infection of the brain caused by a virus. The virus is transmitted to humans by mosquitoes. The history and the future of Japanese encephalitis (JE) immunization in South Korea are discussed with consideration of the situation in the year 2000.